Earthways is delighted to celebrate our fourth year of collaboration with Salmonberry! 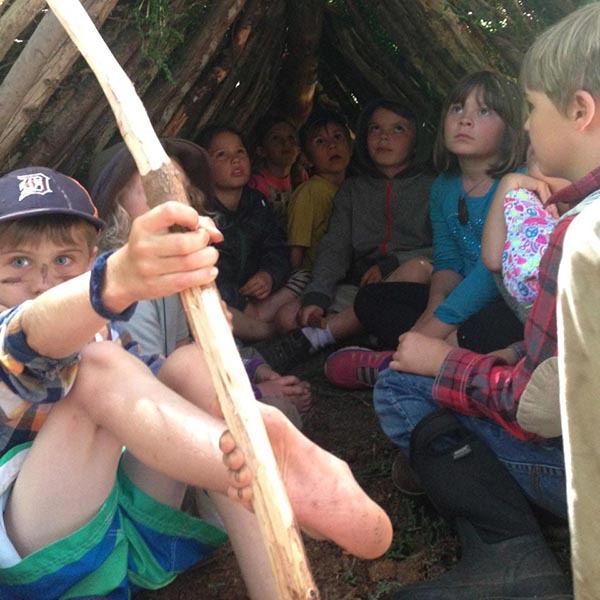 This popular camp returns to our favorite cedar grove at the beautiful Glenwood Hatchery on Orcas Island with co-directors and mentors Cody Beebe and Terry Drussel. Expect a week filled with storytelling, sensory awareness games, basic wilderness survival practices, re safety, primitive shelter building, carving safety and primitive tool carving, simple forest navigation, native plants, local animals and habitats, language of the birds, and animal tracking. Campers will have the experience of daily quiet time at their chosen favorite spot. To register for camp, you can use the “ticketing” function below, or download and print the fillable PDF, which can be sent to Salmonberry School with your payment. **Please note: if registering for more than one camp, the PDF may be more convenient. If a camp is listed as “full” below, please contact the school to see if there may be some extra room. Download a fillable PDF registration form.